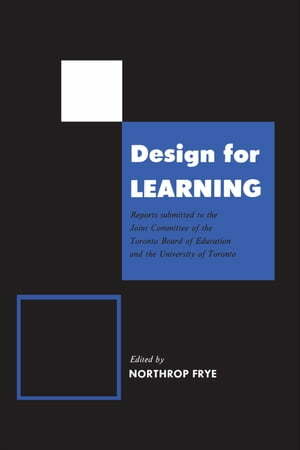 Collins Booksellers - Design for Learning by Northrop Frye, 9781487597320. Buy this book online. This important book is the result of a study of school curriculum undertaken by a joint committee of the University of Toronto and the Board of Education for the City of Toronto. Three sub-committees, dealing with English, Social Science, and Physical Science, here present preliminary reports which indicate the need for perpetual study if the school curriculum is to be kept abreast of modern developments in each discipline. Committee members responsible for the reports are themselves elementary, secondary or university teachers of experience. Their recommendations, embracing all grades up to and including Thirteen, are specific, stimulating and controversial. They are unanimous only in their concern that necessary changes be made and that study of the curriculum be continuous and objective. The reports are prefaced by a discerning essay written by Northrop Frye, Principal Frye points out that "the real barriers to break down were those between the three major divisions of education, the primary, secondary and university levels, each of which tends to become a self-enclosed system, congratulating itself on its virtues and blaming whatever deficiencies the educational process as a whole may have on the other systems." This book will be of interest to teachers at all levels, to officials, responsible for policy in our public education, to trustees, to parents, and to the increasing number of general public who care about education. The Chairmen of the three committees were: English, Mary Campbell (Parkdale Collegiate Institute); Social Science, C.B. Macpherson (Department of Political Economy, University of Toronto); Physical Science, Charlotte M. Sullivan (Department of Zoology, University of Toronto). The Editor, Northrop Frye, is Principal of Victoria College, University of Toronto.